We think that variations on a great theme can make another great theme. 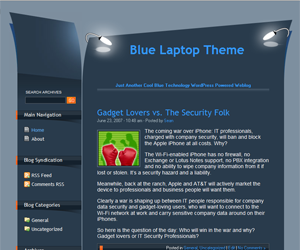 For that reason, we are excited to announce the release of The Blue Laptop Theme for WordPress, cousin of The Dark Laptop Theme. Blue Laptop is the daytime version of Dark Laptop. Filled with about six different shades of blue, the theme has a calm, soothing effect on its readers. Just like Dark Laptop, this theme is chock-full of stylistic curves and design elements that you haven’t seen in any other theme before. Straight out of the box we believe that the Dark Laptop and Blue Laptop themes are among the most professional and original looking free WordPress themes ever available. If you’re looking to distinguish yourself from the crowd, without spending a penny on theme design, these are the themes to use. Blue Laptop is the perfect theme for any topic in entertainment, technology, literature, or even professionals in counseling or law. Update: Blue Laptop has been updated for compatibility with WordPress 2.7 and up. Download the latest version here. Visit the Performancing forum for the Blue Laptop theme support. ⟵What Makes a WordPress Theme Great? I think it’s a bit too dark..